The vaporizer industry has experienced explosive growth in recent years and vaporizers are becoming more and more efficient and technology is undergoing rapid advancements. As such, it is necessary to keep up with all of the developments and best products so that you know which vaporizers are going to give you the best vaping experience each time you have a vape session. In this article, we will look at the 12 best convection dry herb vaporizers of this year and give you an in-depth look into each of the products. Let’s dive in! For those who have not heard of the term, a convection vaporizer is a vaporizer that utilizes a certain type of heating system in order to vaporize the dry herbs contained inside. We will take a closer look at the different type of heating mechanisms utilized by vaporizers in the next section. There are three types of heating systems that dry herb vaporizers use in order to heat and vaporize the herbs you put in their chambers: conduction, convection, and hybrid heating. Conduction heating is a heating method that applies the heating element directly to your herbs for vaporization. For example, a heated plate inside of a chamber will come into contact with your herbs and release the active ingredients. Convection heating is a type of heating that uses hot air surrounding the substance to vaporize it. This way, you don’t run the risk of burning your herbs since they do not come into contact with any heating elements. Hybrid heating is a combination of both convection and conduction heating elements. In so far, here are the 12 best convection style vapes of 2019 to use for your dry herb flowers. For those who are looking for a more compact version of the DaVinci IQ, you’re in luck! DaVinci also released a more compact version of their IQ known as the DaVinci MiQro and it is every bit as great as their previous model. Let’s see what this little vaporizer has to offer. Anodized Aluminium Body Protects Device From Any Dangerous Falls or Impact. Much like the DaVinci IQ, the compact DaVinci MiQro provides the user with a great experience. Regarding the build of the device, the MiQro is made from anodized aluminum to make sure that it is protected regardless of what it may encounter and making it extremely lightweight for improved portability. While it does not have the same number of LED dots as its predecessor, it does have 15 LED dots that function the same on the front of the device. In addition, this device features hidden positive affirmations that show up on the device after one is done with their vape session. The vapor quality is also just as great as the previous model and contains all of the same elements as the IQ does and some argue that the vaporization experience is actually more impressive on this model, which gives you a good indication as to how well it performs! Using your MiQro is similar to using the IQ. Simply remove the magnetic cover from the device, grind up the dry herbs of your choice, and load them into the chamber contained under the cover. (This chamber can also be adjusted to fit your needed bowl size) Once you have packed your herbs, replace the cover and press the power button five times in quick succession. The device will power on and you can use the power button to again switch between smart paths and precision temperature control. Once you have decided on your chosen heating system, simply use the up and down buttons to select your temperature or smart path. Arguably one of the best pocket-sized vaporizers on the market, the Flowermate V5.0s Mini Pro is an extremely versatile and well-made vaporizer that provides users with the vaping experience they have been searching for. These are some of the reasons why this little vaporizer packs a big punch. The Flowermate V5.0s Mini Pro, despite being very compact, is a sturdy piece of machinery made from medical grade materials that help to protect the device from damage and protect the flavors of your vapors from being diluted as they travel through the device. Standing at just five inches, this impressive device comes with valuable vaporizer features such as an LED display and precision temperature control as you would normally find in larger pieces. The vapor quality is also said to be fairly good considering the size of the device as well. The isolate air path and the borosilicate glass mouthpiece work to keep the flavors of your herbs pure and while the vapors are certainly hot, the mouthpiece works to cool it down a bit before it reaches the user’s lungs. Overall, it is a great pocket-sized vaporizer. To begin using your Flowermate V5.0s Mini Pro vaporizer, you will first need to remove the borosilicate mouthpiece from the top by sliding the airflow adjusting cap. Then, place the larger of your screens in the chamber and place your ground herbs into the chamber but carefully as to not overload the chamber. After you have loaded the device, put the mouthpiece back on and turn on your device by pressing the power button five times in quick succession. Hold the power button for a quick two to three seconds after turning it on to activate the heating process and wait for the device to properly heat up to meet your desired temperature setting. Then, you can begin taking slow draws through the glass mouthpiece to begin your vaping session. Much like the Boundless CFV model, the Boundless CF vaporizer is an excellent product. Instead of opting for the simplistic yet sophisticated design provided by the other model, the CF utilizes a more futuristic tone with wavy ridges and bright LED lights that indicate different temperature levels and settings. The design is finished off with a sleek, shiny top and bottom cover that really ties the piece together. The vaping experience is just as amazing as the design as the previous features of the CFV combined with the hybrid heating system help to create thick vapor clouds that are rich in flavor and aroma. Basically, if you are trying to look great while you are vaping your dry herbs, the Boundless CF vaporizer is an excellent choice for you. To begin using your Boundless CF vaporizer, simply follow the steps listed below! Before you start trying to use your vaporizer, make sure to plug it in and let it receive a full charge. Find the chamber at the top portion of your unit, which is located directly below the mouthpiece. You can access the chamber by turning the mouthpiece in a half rotation, which will align a 90-degree angle from the unit body and the mouthpiece compartment. To accomplish this, press the mouthpiece in and down. Then, rotate it clockwise and remove the top portion. Once it’s out of the way, grind down your dry herbs of choice and lightly load the chamber, tamp it down, and then perform the reverse of the procedure listed above to replace the mouthpiece. Once it has been loaded, turn on the unit on by pressing the “fire” button five times in quick succession. Choose the desired vaping temperature by pressing and holding the “fire” button until your selection is found. Wait for the light to begin steadily glowing. You can now begin your vaping session! Like the other vaporizers on this list, the G Pen Elite is a portable vaporizer that comes up quite a bit in conversation and for good reason. The G Pen Elite is an excellent convection-based vaporizer that is sure to provide you with the quality vaping experience that you are looking for. Here is what you can expect when you begin using a G Pen Elite. For more experienced vape enthusiasts, the vape experience with this vaporizer can be pleasant but it should be noted that the vapor produced is rather harsh and intense and may not be beginner-friendly. That being said, the vapors produced are said to be great for those who are into more harsh flavors and experiences and the upside is that the vapor produced is never too hot to inhale. To begin using your G Pen Elite, simply follow the steps outlined below! Remove the mouthpiece by pulling it upwards, which will expose the ceramic chamber. Ground your dry herbs finely, place them into the chamber, and replace your mouthpiece. Remember that you should pack your chamber snugly but not too tight. Power the unit up by pressing down the power button five times in quick succession. Adjust the unit to reach your desired temperature using the +/- buttons located on the side of the vape. Hold the power button down for one second to lock in the preferred selection. Wait until the display screen on the unit shows the temperature that you set. Once it has reached that temperature, you can begin vaping! The Boundless CFC 2.0, an upgrade from the previous release, focuses on making the portable vaporizer extremely easy to use while simultaneously providing a vape experience that would be typically expected from more complex models. Let’s dive into what the Boundless CFC 2.0 has to offer. While some users may find the build attractive and others may find it simple, there is no doubt that the build helps to ensure an excellent performance from the device. Built from medical performance, the Boundless CFC 2.0 ensures a clean vaporization experience as well as a safe one due to the ridged body that improves the users grip on the vape and helps to keep the heat from leaking out of the device and harming the user during use. Because it is shaped more like a vape pen, it is simple to use and its OLED display keeps the user informed about the current temperature levels and battery health. Regarding the quality of the vapor, the Boundless CFC 2.0 vaporizer is said to produce decent flavors and aromas in thick clouds, which are generally experienced over temperatures of 390°F. However, these vapors are also fairly thick and smooth at lower temperatures and the addition of the water pipe adapter can help users to cool down their vapors if they should find that it is too much for them. If you decide to purchase the Boundless CFC 2.0, you won’t have to worry about complicated use. To begin using, grind down your herbs and remove the mouthpiece to reveal the inner chamber. Place your ground herbs into this inner chamber but make sure not to fill it up too much. Replace the mouthpiece and turn on the device by pressing the power button five times in quick succession. Use the temperature buttons on the device to find your desired temperature and give it some time to heat up. Once it has properly heated to your temperature, you can begin vaping! If you were impressed by the G Pen Elite, you are also guaranteed to be impressed by the G Pen Pro, another portable vaporizer produced by Grenco Science that boasts a sleeker look and simpler functionality. If you were wondering what else Grenco Science had under its sleeve, let’s see what they’ve managed to accomplish with the G Pen Pro. While this is one of Grenco Science’s better offerings, there are some places where it lacks in quality or simply fails to meet our expectations. However, let’s start with the build. The build of this model is where Grenco Science truly succeeded as the model is smaller, thinner, and sleeker than before. The single button design makes it really simple to operate and the LED color-coded light display and three preset temperature settings make it perfect for newer users. While the build is excellent, the vapor quality is what we truly have a problem with. The vapor quality of this device could be described as average at best as it does not provide the excellent experience that other brands or models do. That being said, one redeeming quality is that its draw resistance is great but you must exercise caution as this can easily be changed if you overload the chamber. Much like many other Grenco Science products, the G Pen Pro is simple to use. Begin by first grinding your herbs down and removing the mouthpiece from the device, thereby revealing the inner chamber. Place those herbs into that chamber, making sure to not overload the device, and then put the mouthpiece back onto the device. Turn on the device by pressing the power “leaf” button five times in quick succession. The first light that will turn on will be the blue one and this is the lowest temperature. You can change it by pressing on the “leaf” until you have reached green or red, which are higher temperatures. When the light has stopped blinking, it has been properly heated and you are ready to start vaping! The Firefly 2, Firefly’s build upon their initial model that changed the game of dry herb vaping, is an excellent piece of vape technology for those who truly value their vape sessions. Let’s take a closer look at what it provides. When it comes to the build quality of the Firefly 2, this vaporizer is a brilliantly designed device. Featuring a body that is slightly smaller than their previous product and lighter as well, the Firefly 2 comes with fantastic features such as a mouthpiece that is removable and is made out of BPA-Free and FDA-approved food-safe Triton polymer, a faceplate that is also removable but remains shut using a strong magnetic feature found on the plate and the inside of the device, and an excellent chamber and vapor pathway made of borosilicate glass that is visible through the device’s porthole. Overall, the Firefly 2 was built with the consumer’s needs and desires in mind. Speaking to the overall vaping quality of the Firefly 2, this vaporizer utilizes a small oven to make sure that each hit is fresh and enjoyable. Because the pathway and the chamber are built from borosilicate glass, you are guaranteed to get flavorful hits each time. This, combined with the convection heating system, gives you outstanding vape sessions each time you want to vape your dry herbs. Arguably one of the most well-known portable vaporizers on the market, the DaVinci IQ is not only an excellent vaporizer but an astounding piece of technology as well. Let’s see what you can expect from this vaporizer when you begin using it. The DaVinci IQ is revered for its build and its functionality and it’s not hard to see why. Regarding the construction of this device, the DaVinci IQ is a very light vaporizer protected by its high-quality anodized aluminum body. All of the buttons and external pieces of this device are well made and the overall feel is excellent. In addition to the well-built internal and external components, the vaporizer is also technologically advanced, featuring a 51 LED light grid that shows all of the functions of the device and the ability for the vape to be connected to a Bluetooth app. Regarding the quality of the vapors, users state that the taste and feel are excellent. 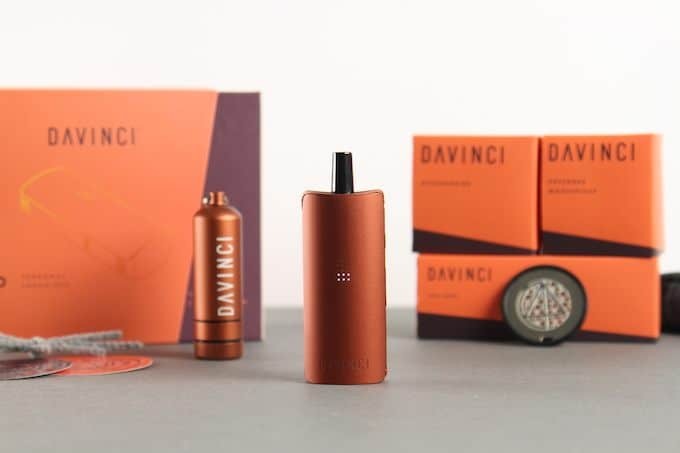 The DaVinci IQ uses a ceramic inner chamber and vapor path to ensure that the quality of the vapor flowing through the device remains untainted by any of the internal pieces. In addition, the DaVinci IQ switches up the game by adding an additional flavor chamber near the base of the mouthpiece so that you can add extra herbs that are heated up by the oncoming air, adding hints of flavor to your draws. Overall, the DaVinci is a revolutionary vaporizer that continues to hold its place at the top. To use your DaVinci IQ, simply grind down your herbs and load them into the chamber. Then, press the start button five times in quick succession to activate the vaporizer and use the buttons on the device to properly set your desired temperature or use a preset temperature setting option. While it may lack some of the glamour and dazzle that other vaporizers on the market provide, the Arizer Solo 2 has managed to carve a niche for itself in the market and those who have gone with this vaporizer have not been disappointed. Here are some of the reasons why the Arizer Solo 2 has been such a popular product among vape enthusiasts. The biggest reason why this product has managed to maintain its place in the market is due to its excellent build quality and functionality. This vaporizer is built from high-quality, heavy-duty materials to make sure that it is protected no matter whether you choose to travel with it or if you find that you consistently put your vaporizers through accidents. Besides the sturdy construction, the Arizer Solo 2 is said to produce a rich, dense vapor that is further enhanced by the glass pathway to ensure that you have a great session each time. The Arizer Solo 2, like its design, is made for simplicity. Simply grind down your herbs and place them into the chamber. Once the bowl has been loaded, hold down the button that says “M” as well as the up button until the LED display says the word “Hi”. The device will then count down to zero. Once it hits zero, the device will be ready to use. All you have to do is set the temperature and begin vaping! Another excellent product developed by Arizer, the Arizer Argo is the perfect product for those who are looking to use a vaporizer that is both efficient and portable. Here is what you will get when you purchase an Arizer Argo. While the previous Arizer product was built for durability, the Arizer Argo is built more for portability and has some potential issues with the quality. For example, the glass stem that is used in the device has its own special compartment within the device. However, this design increases the possibility that the glass can be broken or that the piece helping to contain the glass could break. Overall, the build quality could be best described as fair but not excellent. The vapor quality, on the other hand, is said to be quite impressive. Because the vaporizer uses glass to carry the vapors from the oven to the user, the flavor is maintained. In addition, this vaporizer is said to produce thick, flavorful vapors that can be easily pulled out in large volumes when the user is taking draws. It’s easy to begin using your Arizer Argo. To begin taking draws from your vape, simply follow the steps below! Load the mouthpiece by dipping the end of it in your herb supply. Make sure to gently tap the end of it so as to loosen the herb so that air can pass through the mouthpiece. Place the end of the mouthpiece that contains the dry herbs into the Argo and press down onto the top of the device so that the mouthpiece is exposed. Turn on the vaporizer by holding down the plus (+) and menu buttons at the same time. Use the plus and minus buttons to select the desired temperature. The Argo will make a beeping sound twice once the selected temperature is reached. This indicates that you can begin vaping by slowly inhaling from the mouthpiece. The Argo has custom session settings to allow you to have full control over your vape sessions. You can also adjust the temperature while you’re vaping if you want further customization. In case you are feeling a bit of deja vu while reading the title of this vape, this is not a product that we have already reviewed. The Arizer Air 2 is one of the company’s slimmer offerings that provide added portability in a device that can handle the expectations of a modern portable vaporizer. Here is what the Arizer Air 2 has to offer. If this is your first time hearing about the Arizer Air 2, don’t let its small build fool you. The Arizer Air 2 is not only stylish but well-built as well. Featuring a pen-like body that is encased in high-quality materials and featuring helpful parts such as a digital display that is easy to operate as well as audio cues, borosilicate glass tubes that are protected by the body, and stylish colors, its a product that is hard to beat. The vapor that is produced by this product is thick and flavorful and is improved by the fact that the Air 2 has added more heating power in this product than in previous products. The flavor is improved by the addition of the glass tubes and is guaranteed to provide a great vaping session each time. Overall, the Air 2 is perfect for anyone who wants a discreet, portable vaping experience each time they pull out their vaporizer for a session. To begin using your Arizer Air 2 vaporizer, grind down your herbs and place them in the loading chamber of the mouthpiece. Once your herbs are loaded and ready to go, activate your vape by holding down the up and menu buttons at the same time. The display will light up and a countdown will commence as soon as it has turned on. (This will be made clear once an audible beep has been heard.) Once it has been turned on, you can change the temperature using the up and down buttons and heating will begin automatically. Then, all you have to do is start vaping! Whereas some vaporizers may focus more on style or more on functionality, the Boundless CFV seeks to provide both for the user in a way that is reminiscent of a high-end car: classy and great at what it does. Let’s dive into what users receive when they purchase their own Boundless CFV vaporizer. As we stated above, the overall quality of this piece is excellent. While the body may not be as futuristic in design as some other vaporizers on the market are, the body is made of high-quality materials formed together into a sleek, modern design that screams “luxury”. In addition to the external feel of the product, internal pieces such as the wooden rings add a further touch of complexity and help to play into the overall flavor quality. The piece is wrapped together with desirable features such as its digital display and easy to use control buttons. Much like its design, the vapor quality of this piece is excellent as well. Because of the added quartz heat retention rings, the vapor clouds that are produced are thick and flavorful and the wooden heat retention rings add their own subtle flavoring to whatever vapor you are getting out of the device. Overall, this piece is excellently built and delivers an equally great vapor experience. To begin using your Boundless CFV vaporizer, follow the steps below. Make sure that your device has been fully charged before its first use. Twist open the top of the unit with a half turn to reveal the herbal loading chamber. Loosely load the oven with the medium to finely ground dry herb of your choice. Secure the mouthpiece back onto the device to close the heating chamber. Power your unit on by pressing the power button five times in quick succession. Choose your desired temperature by using the plus or minus buttons. Wait for the heat wave icon to appear on the face of your digital display. Once your device has revealed the heat icon, place your mouth on the mouthpiece and savor the flavor as you slowly inhale. Convection vaporizers are some of the best vaporizers as these products function to make sure that your herbs are properly vaporized so that you receive the best vaping sessions each time. If you are in the market for a convection vaporizer but are unsure of where to begin, use the comprehensive guide above to learn more about what convection vaporizers are the best and which ones you should be looking at when you start shopping around!